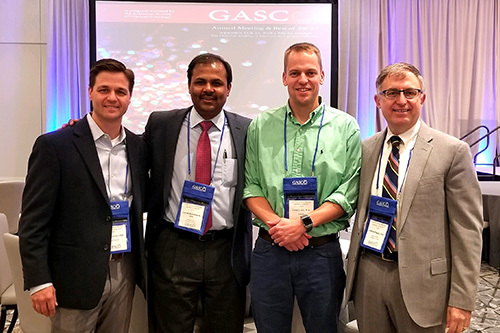 Winship Deputy Directory Suresh Ramalingam, MD (second from left), pictured with Georgia Society of Clinical Oncology leadership Crain Garrot, MD, Grant Lewis, MD and Andrew Pippas, MD. Winship Deputy Director Suresh S. Ramalingam, MD, was recognized as the new president of the Georgia Society of Clinical Oncology (GASCO) at the conclusion of GASCO's Annual Meeting and Best of ASCO® conference held September 14-15 in Alpharetta, Georgia. GASCO is the state affiliate of the American Society of Clinical Oncology (ASCO) and serves the professional needs of Georgia's oncology providers in coordination with the national parent organization. Ramalingam has served as vice-president of GASCO since 2016. Ramalingam, a clinician-scientist specializing in lung cancer, is a professor in the Department of Hematology and Medical Oncology, the Roberto C. Goizueta Distinguished Chair for Cancer Research, and assistant dean for cancer research in the Emory School of Medicine.